As incoming President of the Longwood Rotary Club, Tim Rayne will be continuing the club’s tradition of taking the Polar Plunge into the Brandywine River as a participant in the Brandywine Red Clay Alliance 2016 Polar Plunge. 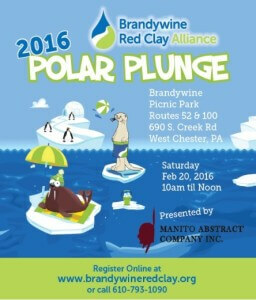 The event will be held at the Brandywine Picnic Partk on February 20, 2016 with registration 10 to 11, costume awards at 11:15 and the Plunge into the Brandywine River at 11:30. Registration fees are $35 and $25 for students. Participants are encouraged to form teams and raise money. Proceeds benefit the Brandywine Red Clay Alliance which protects and conserves the natural resources of the Brandywine and Red Clay Valleys. Since 2008, nearly 1,200 people have taken the Plunge and raised over $100,000. It’s looks like it’ll be about 50 degrees at plunge time. See you there!!! !